Oceanic and atmospheric indicators remain generally within the range of ENSO-neutral but have shifted more towards La Niña conditions in the past month (Figs. 1-2). 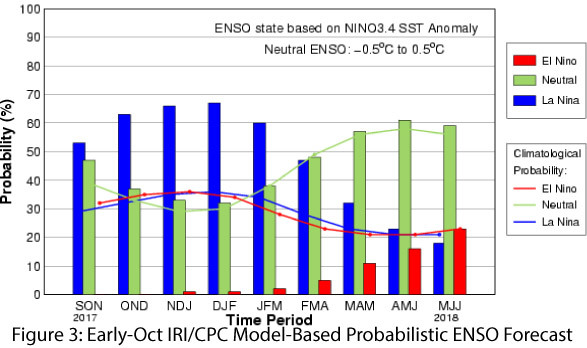 Most seasonal outlooks and forecasts reflect these changes, and continue to call for the formation of a La Niña event as the most likely outcome by the end of fall and continuing into this winter. On Oct. 10, the Australian Bureau of Meteorology noted that all oceanic and atmospheric indicators remained ENSO-neutral, and highlighted recent short-term warming of sea surface temperatures in the tropical Pacific after a longer period of cooling. On Oct. 11, the Japanese Meteorological Agency (JMA) forecast a 50-50 chance of either ENSO-neutral conditions persisting through winter or La Niña conditions developing in fall or winter. On Oct. 12, the NOAA Climate Prediction Center (CPC) observed that while oceanic and atmospheric conditions remained ENSO-neutral, they had “edged closer to La Niña conditions,” with a 55- to 65-percent chance of a La Niña event this winter. On Oct. 19, the International Research Institute for Climate and Society (IRI) and CPC briefing noted further short-term cooling in sea surface temperatures, and forecast a 70-percent chance of La Niña by the end of 2017. The North American Multi-Model Ensemble (NMME) is borderline weak La Niña as of October 2017 (Fig. 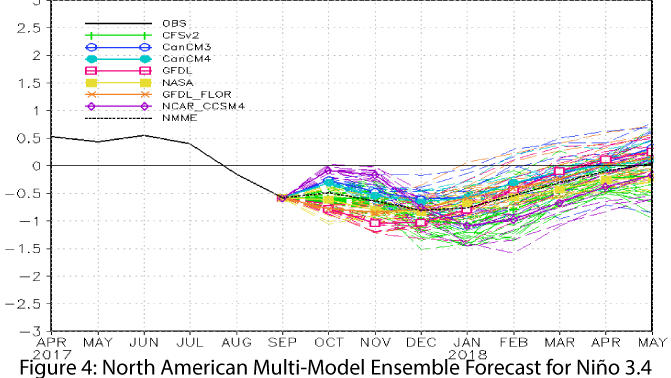 4), with a majority of the models predicting a weak La Niña this winter. Summary: The seasonal outlooks have turned more bullish on a weak La Niña event developing this fall, if you can call tentative forecasts that hint at the possibility of a short and weak La Niña “bullish.” Despite the fact that many ENSO indicators have remained within the range of neutral, forecasters are seeing enough evidence in the data to be relatively certain that a La Niña event is the most likely outcome this winter. It is late in the forecast window for so much uncertainty about the upcoming winter; the signal is usually clearer by mid-October. 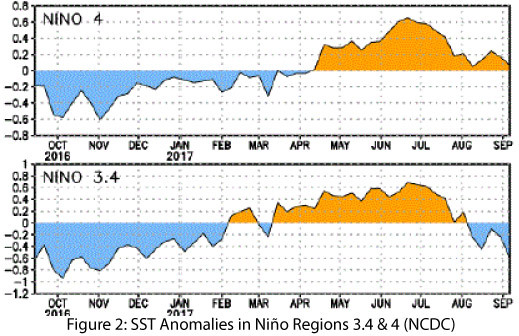 Last year, the sea surface temperature anomalies had already consolidated into weak La Niña status by October, whereas this year there is still quite a bit of movement around the boundary between ENSO-neutral and weak La Niña. Given the warmer- and drier-than-average winter conditions associated with La Niña in the Southwest, the possibility of a La Niña forming might generate concern regarding winter precipitation and persistent drought in the Southwest. However, it may not ultimately make much difference whether the conditions resolve into weak La Niña or borderline weak ENSO-neutral: southwestern winters are relatively dry and neither scenario is likely to bring much precipitation.